Help spread the word about San Francisco CASA with these stylish and comfortable pieces! 60% combed and ring-spun cotton, 40% poly. Women's sizing. For a bold design, try our graphic-print sweatshirt. The front is adorned with "love grows here" and our iconic image of a child playing in leaves, while the back features "Fostering Change". The sweatshirt is Bella + Canvas in dark heather grey. 52% poly, 48% viscose. Women's sizing. 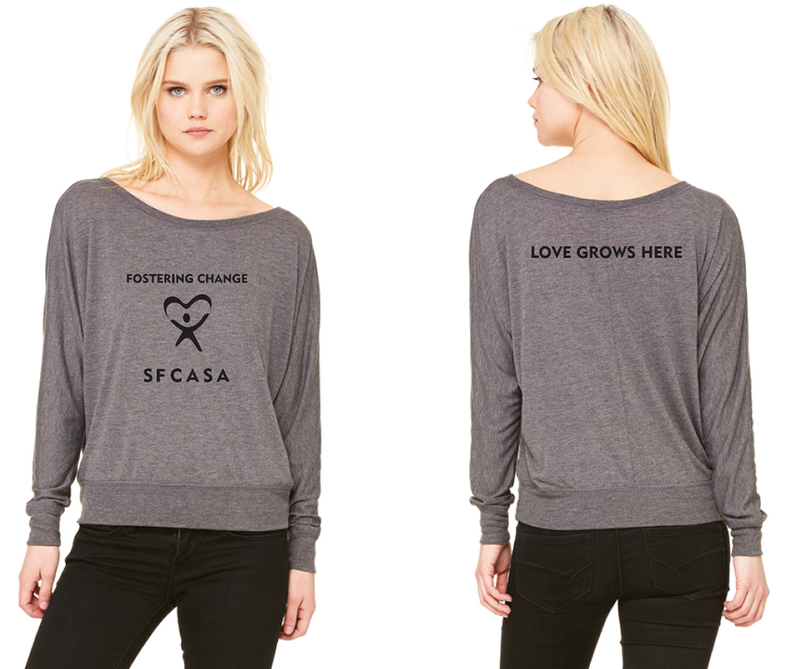 Our Bella + Canvas longsleeve shirt is the perfect way to rep SFCASA. With our logo and "Fostering Change" prominently featured on the front, and "Love Grows Here" across the back, you're ready to go in style. 90% combed and ring-spun cotton, 10% poly. Men's sizing. For men, we have an ultra sporty Bella + Canvas hoodie. This look features white accent details, the SFCASA logo on the front and "Fostering Change" on the back.